LANSING, Mich. -- Michigan Gov. Rick Snyder is likely to devote much of his annual State of the State speech to a drinking water emergency that has put Flint residents at risk and engulfed his administration in controversy and criticism. Snyder, a Republican, is expected to further detail plans to address the contamination of Flint's water with lead during his address to the GOP-led Legislature Tuesday night. Michigan is already providing lead testing, filters, bottled water and other essentials in the city of 99,000. Some say customers shouldn't have to pay their water bills because the water is unsafe without filtering, but it's unclear if lawmakers will cover the expense. Flint residents and activists are planning to rally Tuesday night in the capital as Snyder delivers the speech. Snyder declared a state of emergency in Flint earlier this month. On Saturday, President Obama signed an emergency declaration but denied Snyder's request for a disaster declaration based on the legal requirement that such relief is intended for natural events, fires, floods or explosions. Snyder says he'll ask the president to re-consider the disaster declaration, and Flint Mayor Karen Weaver was headed to Washington Tuesday in hopes of securing it. That would provide more money and resources than the emergency declaration. "The state of emergency only gives us a $5 million cap," explains Flint City Councilman Wantwaz Davis," adding that a disaster declaration would provide $96 million or more. Dozens of people protested outside Snyder's residence in downtown Ann Arbor Monday afternoon, braving sub-zero temperatures to march there from the nearby University of Michigan campus. 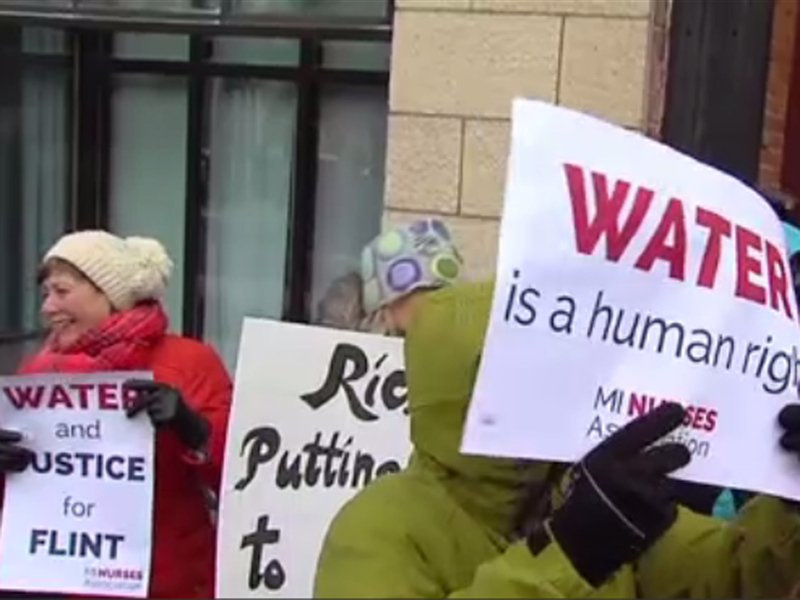 Among the signs were ones saying, "Water is a human right" and "Justice for Flint." They said he didn't act swiftly enough to help Flint residents and held signs calling for his resignation and arrest. Demonstrators said Snyder knew about Flint's tainted water long before switching the city's water supply back to the Detroit system and long before he declared the emergency January 5. "He should have switched it back over to Detroit water as soon as he knew of the contamination," insisted protester Colleen Crossey. Back in Flint, resident Elena Richardson remarked, "What happens after the water and filters go? We're still going to have the lead, we're still going to have the pipes, we're still going to have the poison." Snyder said Monday he is considering requests from outside groups to release internal emails about the Flint water crisis, The Detroit News reported. His office is shielded from public record requests under state law. Snyder responded Monday to criticism from presidential candidate Hillary Clinton during Sunday's Democratic debate, saying Clinton is making the crisis a political issue. During the debate, Clinton said "every single American should be outraged" by the crisis, adding that, "If the kids in a rich suburb of Detroit had been drinking contaminated water and being bathed in it, there would have been action." Following a speaking engagement at a Martin Luther King Day event in Flint, Synder said her comments won't help solve the problem. "We're going to keep working on putting solutions in place," Snyder told the News. "And what I would say is: Politicizing the issue doesn't help matters. Let's focus in on the solution and how to deal with the damage that was done and help the citizens of Flint and make Flint a stronger community." Sen. Bernie Sanders, of Vermont, who is also running for the Democratic nomination, has called on Snyder to quit. But officials remain concerned that damaged pipes could continue to leach lead, which could cause behavior problems and learning disabilities in children as well as kidney ailments in adults. Members of Michigan's National Guard have been called in to help volunteers pass out drinking water, testing kits, filters and other supplies to city residents, and the state said more Guard members arrived Monday to bring the total to 70. Nearly 5,000 homes were visited Sunday.